On elementary OS? Hit the button to get Harvey. Have you ever been designing or developing something with color and wondered if it passes a contrast check? 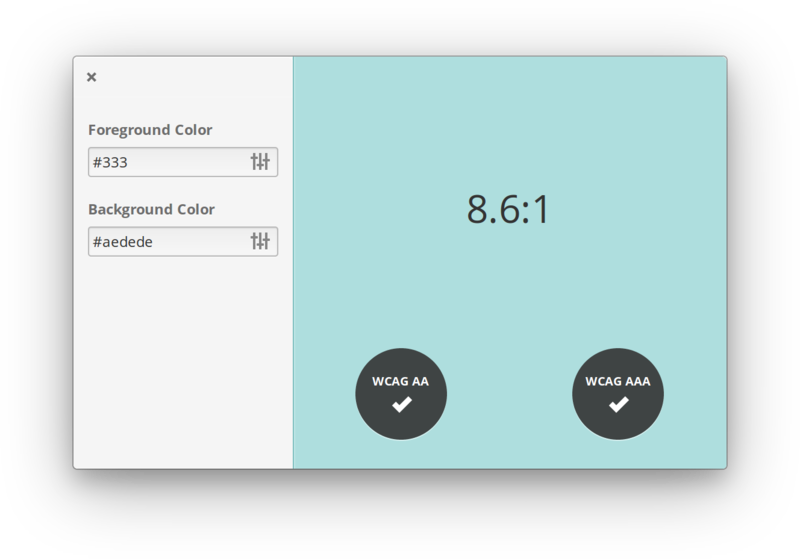 There are countless websites out there that let you punch in some colors to check their compliance to w3.org’s WCAG 2.0 contrast requirements, but a native app could serve this purpose better. That’s why Daniel Fore made Harvey, the contrast checker for elementary OS. I recently chatted with him about Harvey and developing graphics apps for elementary OS. My first question (and possibly yours!) about Harvey: what’s up with its name and tagline? I named the app after the Batman villain Harvey “Two Face” Dent. It’s a bit of a joke about the dual-tone design of the app. The tagline refers to a line from “The Dark Knight” where Commissioner Gordon explains that the city of Gotham needs a hero to rally behind. In our case, Harvey is a hero for designers looking to ensure the legibility of text in their designs. Batman puns aside, Harvey really is a useful app; it’s faster than popping open a web browser, it’s offline, it has a color picker to grab colors right off your screen, and of course (coming from lead elementary OS designer Daniel Fore), it looks great doing it. Dan wrote Harvey to scratch his own itch — a common story behind many great apps — but also to serve as a proof of concept to other app developers targeting elementary OS. I’ve used Harvey and it works well. But what does the future hold? I think Harvey is more or less finished, but I’m open to feature requests and issue reports. I think it does the one thing that it aims to do well, and I’m happy with it. While Harvey is one of the first graphics and development related apps to in AppCenter, Dan shared his hopes for future graphics apps or utilities he hopes to see come to AppCenter next. I get asked often enough to help developers find the names of system icons to use in their apps, so I started playing with a small utility to help with that. I’m not entirely happy with gtk3-icon-browser. I’d like to make something that provides Vala snippets and covers the full range of system icons provided in elementary OS. I’m excited thinking about that icon browser apps and other possible developer-focused utilities for elementary OS. I know the platform itself is well-liked for development, but these types of specialized tools could really help drive adoption as the developers’ platform of choice. Harvey is available today on AppCenter for the suggested price of just $1. Its source code is also openly-licensed and available on GitHub. Give it a download and share your thoughts with Daniel on Twitter or Google+! Also be sure to check out his other app Nimbus, a weather applet. We’d like to say thanks again to everyone who’s bought an app on AppCenter, our supporters on Bountysource and Patreon, and those who’ve purchased a copy of elementary OS or merch from our store. Every contribution helps make all of this possible, and we wouldn’t be here without you! If you’d like to help improve elementary OS and AppCenter, don’t hesitate to Get Involved!